Gamma Control is an easy to use software designed to let you adjust the gamma on your computer, by just pressing a combination of keys on your keyboard. Or you can adjust the gamma levels by using a trackbar. 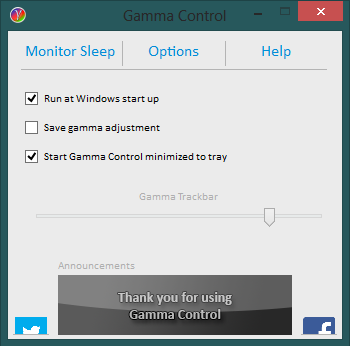 Gamma Control allows you to put your monitor to sleep, by pressing key combinations, which especially proves useful if you have more than one monitor, and you wish you put them in standby mode when you leave. Epic features of version 4 of Gamma Control is that it now offers full customization of hotkeys. Additionally, hotkeys are no longer limited to the keyboard, you can also use the mouse; buttons left, right, middle, button 4/5, scroll up/down. This software is especially useful when gaming, as you only need to press the key combinations and not having to quit the game. Additionally Gamma Control offers two profiles, which is controlled by "CTRL + ALT + S" and "CTRL + ALT + W" by standard, to adjust the gamma respectively to 0 and to the previous used configuration. "CTRL + ALT + +" to turn up the gamma. "CTRL + ALT + -" to turn it down. "CTRL + ALT + *" to make default gamma. "CTRL + ALT + S" press this combination, and your gamma setting will go to Default. (useful in-game). "CTRL + ALT + W" press this combination, and your gamma will go back to your last used gamma setting. (useful in-game). "CTRL + ALT + SHIFT + S" press this combination, and your monitor will enter stand-by. Reviews (version 3 - Please contact us if you review version 4). SoftOxi.com "All in all, Gamma Control is a time saving, handy and intuitive application that will allow you to quickly and easily modify your computer's gamma." 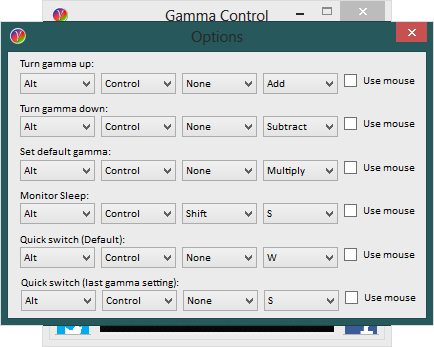 SoftPedia.com "Gamma Control is a handy and reliable utility designed to enable you to adjust the gamma on your computer." - Fixed issue where Gamma Control would not start up with Windows 8. - Added Direct Support button under Help, for contacting DesktopNerds directly on support, suggestions or improvements. - Fixed "Get Support" Button. - Fixed UI for 125% fonts. - Fixed issue, where running at start up would not work. - Font on main interface is changed to ease readability. - Options button is changed, and "About" is moved to the top of the interface, now showing as "?". - The Help interface has been changed, and extra help has been added, e.g. it now shows the monitor at CTRL+ALT+SHIFT+S, indicating that clicking the monitor and using that combination performs the same function. - The Help interface is now being launched at first start up. - Now, you only have to click once to update Gamma Control. (If this is still not the case after updating - Please re-install). Fixed an issue where the save checkbox would not always save the gamma. - Removed click sounds, when Gamma Control is minimized to tray. (Only to be noticed by Internet Explorer version 6 or less-users). - New Aboutbox with more information. - Added possibility to choose between 2 hot key layouts. - New logo for Gamma Control. - When your computer crashes, Gamma Control will no longer erase all your settings. - Fixed Gamma Control savings to save, all settings instantly. - Advertising section is now final. - Disabled "click" sound for IE7+ (If you have Internet Explorer version 6 or less, you might still experience the click sound. Getting version 7 or 8 will fix this problem). - Fixed Gamma Control to save, when shutting down the computer, right after a change. 3. Select Gamma Control and then click Uninstall. Go to C:/Program Files(x86)/DesktopNerds and delete the folder "Gamma Control"
4. Select Gamma Control and then click Uninstall. 5. Select Gamma Control and then click Uninstall. IMPORTANT-READ CAREFULLY: This End-User License Agreement ("EULA") is a legal agreement between you (either an individual or a single entity) and DesktopNerds. SOFTWARE(s) identified above, which includes the User's Guide, any associated SOFTWARE components, any media, any printed materials other than the User's Guide, and any "online" or electronic documentation ("SOFTWARE"). By installing, copying, or otherwise using the SOFTWARE, you agree to be bound by the terms of this EULA. If you do not agree to the terms of this EULA, do not install or use the SOFTWARE. You may use the SOFTWARE without charge. We may place announcement of other products into SOFTWARE. DesktopNerds will not monitor the content of your use (e.g., sites selected or files used). First time you run the SOFTWARE, it will be registered in our databases, however NO INFORMATION WILL BE COLLECTED (such as address, country, name, email). You may make copies of the SOFTWARE as you wish; give exact copies of the original SOFTWARE to anyone; and distribute the SOFTWARE in its unmodified form via electronic means. You may not charge any fees for the copy or use of the SOFTWARE itself. You must not represent in any way that you are selling the SOFTWARE itself. Your distribution of the SOFTWARE will not entitle you to any compensation from DesktopNerds. You must distribute a copy of this EULA with any copy of the SOFTWARE and anyone to whom you distribute the SOFTWARE is subject to this EULA. * Neither the name of Application and Global Mouse and Keyboard Hooks .Net Libary nor the names of its contributors may be used to endorse or promote products derived from this software without specific prior written permission.